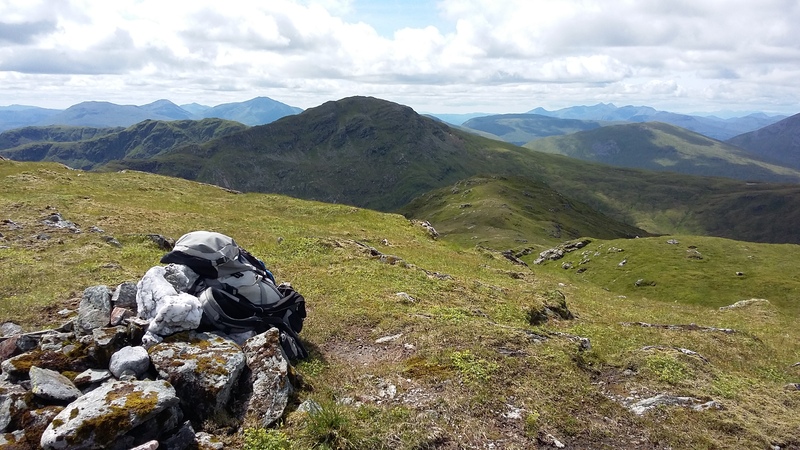 A combination of inauspicious weekend forecasts and family commitments has meant no quarter-way serious expeditions for some months - really, the last one was in mid-March. Some days in Torridon and Skye helped still the itch, but I really was beginning to feel stir-crazy. So, notwithstanding a shortage of remaining annual leave days, I’d decided that I would have to take advantage of any day with a decent forecast, if I could manage to arrange work around a day or two’s leave at short notice - and – lucky me - I’m in the blessed situation that I normally can . Instead of leaving – as I usually do – the reading of the weather runes to my resident expert (the CEO, who has a phenomenal success rate in this department), I started in my amateurish way to look at all the forecasts – Norwegian Met Office, XCweather, MWIS, etc., etc. And all of a sudden, Thursday 14th July was threatening to be a fine day. By Tuesday 12th, the decision was more or less made. MWIS seemed relatively pessimistic, but the other guys were more positive; and on past performance, MWIS tends to be overly cautious. The only cloud on the horizon (groan!) seemed to be the threat of early morning mist. .... on my way to Tyndrum. 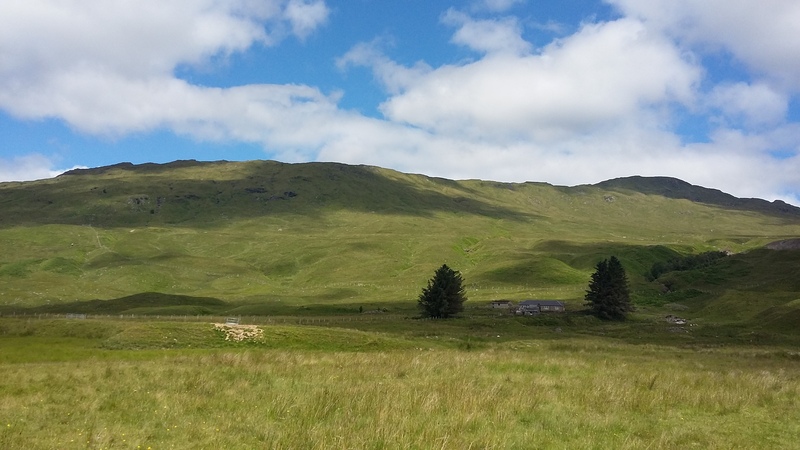 Tyndrum, because a) it’s only 6 – 7 hours drive away – important if you’re short of available time; and b) there are a couple of possible rounds in the area involving what looked from pics like pretty characterful hills. Having looked across from Ben Lui in the stunning sunny/snowy February at Ben Challum and the hills beyond and around and about, it wasn’t too hard to make the choice. Also, I’d originally planned to do the route in March, but the weather gods had stymied that, so it felt like I had some unfinished business. ....which in turn meant that I had to have the windows up. As I was dozing off, I just couldn’t prevent my brain from trying to calculate the volume of carbon dioxide I would produce over the next 6 hours, and then trying to remember whether - and if so, in what concentrations - it might be toxic. Eventually I did drop off, but these reflections made for a rather fitful slumber . I awoke to the alarm at 4.00am, slightly surprised to be alive after all, and was soon on my way. 20160714_043029. 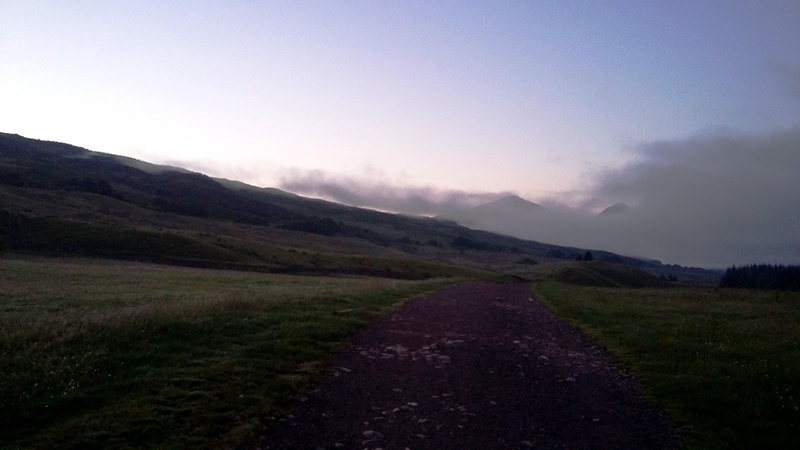 Looking along the West Highland Way at the start of the day, Ben More and Stob Binnein in the background shrouded in morning mist. This looks much more auspicious than the forecast had threatened . 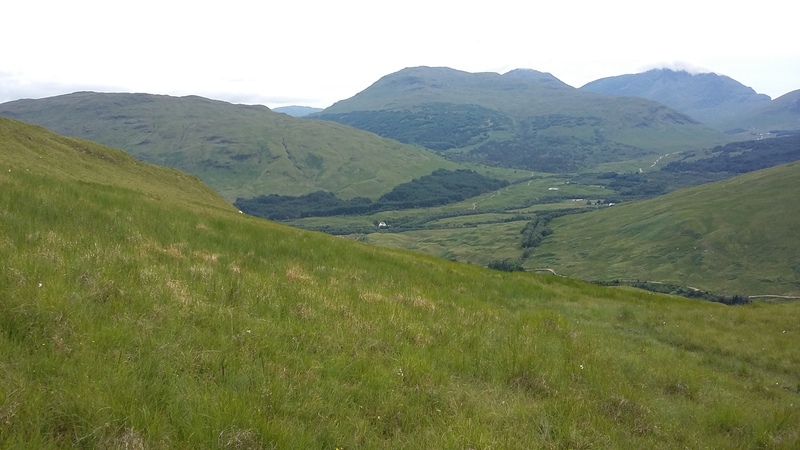 The route I took initially follows the West Highland Way on this semi-metalled track, before turning 90 degrees left at Kirkton Farm up towards the railway, and then walking parallel to the railway the 2 km to Inverhaggarnie. 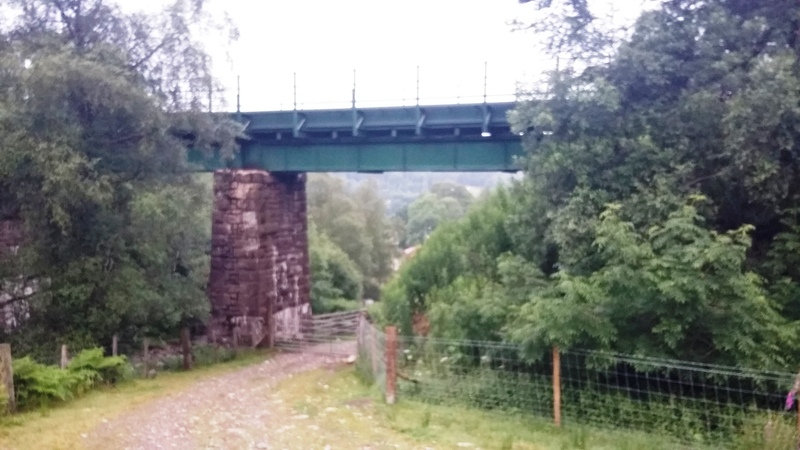 Here you get to a rail bridge, under which you pass to head North East up the side of Inverhaggernie Burn towards the first goal, Beinn nan Imirean. Notwithstanding gaiters, the dew-bedecked grass ensured that my "waterproof" cross-trainers were soon pretty damp. 20160714_050430. Track passing under the railway at the start of the ascent. It's pretty straightforward going up the side of the burn, though no track. 20160714_051647. 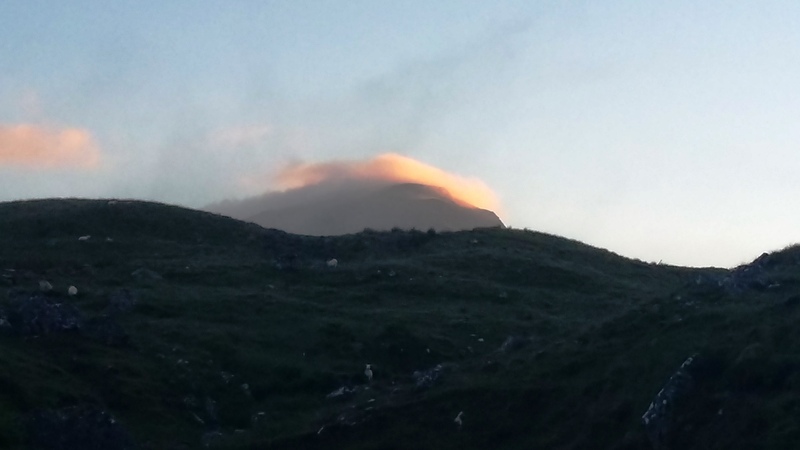 As I ascend, Ben Challum comes into view, looking amazing with its early morning cloud cap. This is where I hope to be in 12 hours or so. 20160714_051946. 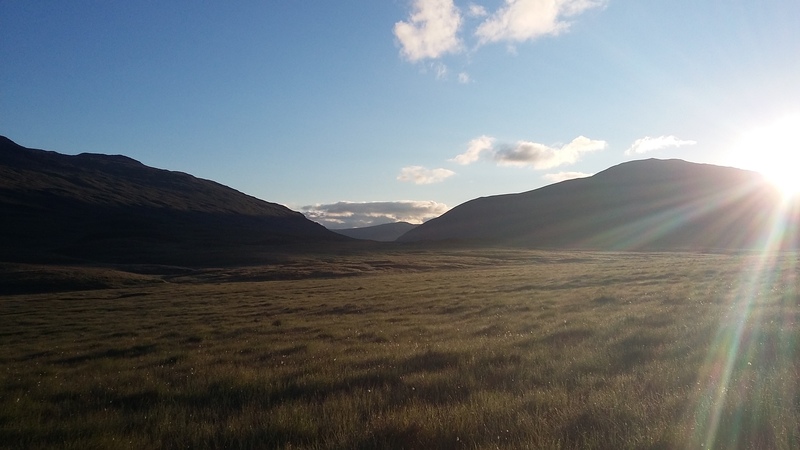 Looking South in the opposite direction, Ben More in the dawn light. Magic! After about 1.5km I cross the burn where the trees on the East side of the burn stop, and here I get into bog land. I'm doing pretty reasonably in avoiding a dunking when I foolishly step on a bright green bit . Black gunge half way up my calf. 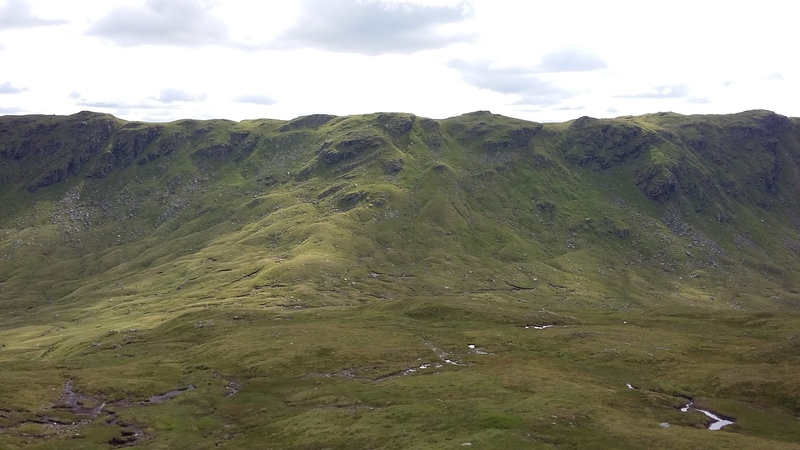 But as it turns out, notwithstanding a several km long yomp across bog land to the base of Beinn nan Imirean, I manage to avoid any repetition dunk. For anyone who might contemplate this route, I would not be put off by the prospect of crossing this area. 20160714_054435. About 2 km of bog - but very acceptable in the morning light: what do wet feet matter? Beinn nan Imirean in the background. 20160714_061555. 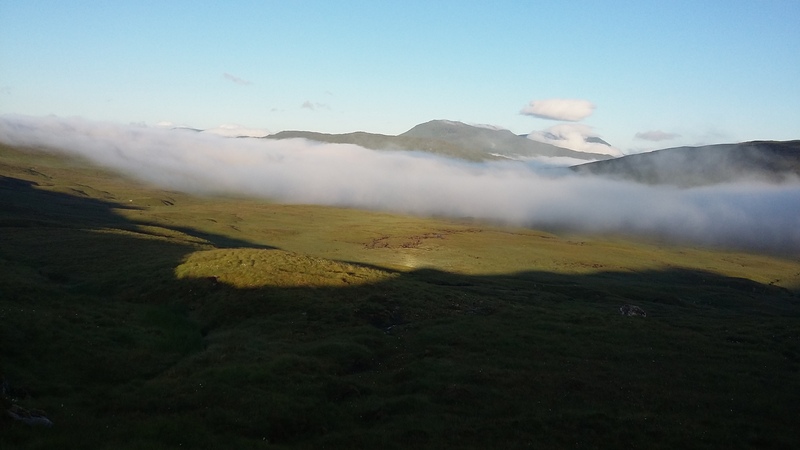 Looking back in the opposite direction from the lower slopes of Beinn nan Imirean across the bog land I've just traversed, it seems like the decision to start early was a good one, as cloud engulfs the lower levels. In the background Beinn Dubhcraig and Ben Lui. 20160714_062244. Very difficult to stop snappin!. Looking more or less South East, Ben More to the left, and then Stob Garbh, Cruach Ardrain, etc. to the right. 20160714_063357. Not sure what the hill in the background is - Loch Earn Ben Vorlich???. It just looks amazing! I must have taken 50 pics already (I'm reminded of Black Panther's reports, where she and Kevin also seem to succumb to the same frenzy of snapping, as one tries to capture and retain these wonderful views). 20160714_070344. 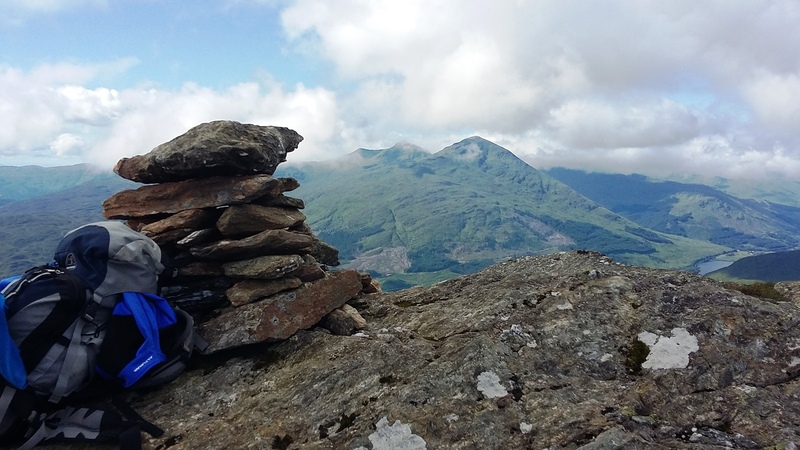 It's a gentle ascent to the summit of Beinn nan Imirean. This view of the summit is looking North East towards Meall Glas (can't understand how the pic is blurred - shutter speed is 1/2930!!!). 20160714_070416. 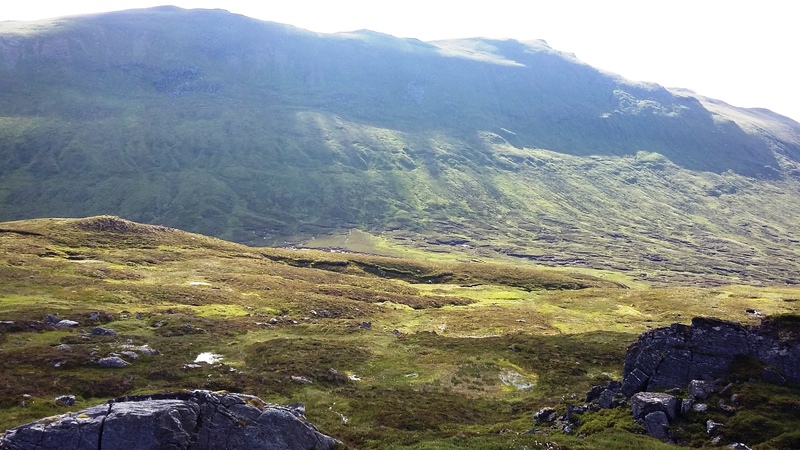 Easy ground for the 180m or so descent to the bealach, before the climb up to Meall Glas. In the background just behind is Sgiath Chuil. 20160714_072645. 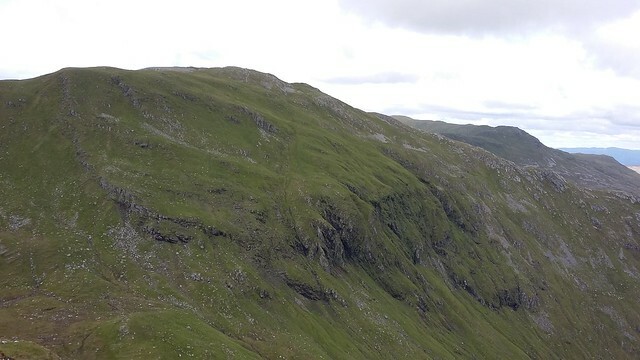 The descent to the bealach is pretty straightforward, though a bit steep in parts and cliffs to avoid, as noted below. Ahead Meall Glas. 20160714_074550. Looking back at the descent from Beinn nan Imirean. Generally no issue, though one would need to be a bit cautious in clag, given the odd cliffs. 20160714_080931. Half an hour and 300m ascent later I'm on the summit. This pic is looking more or less East from the summit of Meall Glas, the cairn fashionably offset by the trusty Eurohike sac. Time for another croissant with marmalade. It's pretty warm now, and the "waterproof" cross trainers are more or less dry . The day is just glorious - I'm stripped down to shorts only (no selfie!). 20160714_080942. 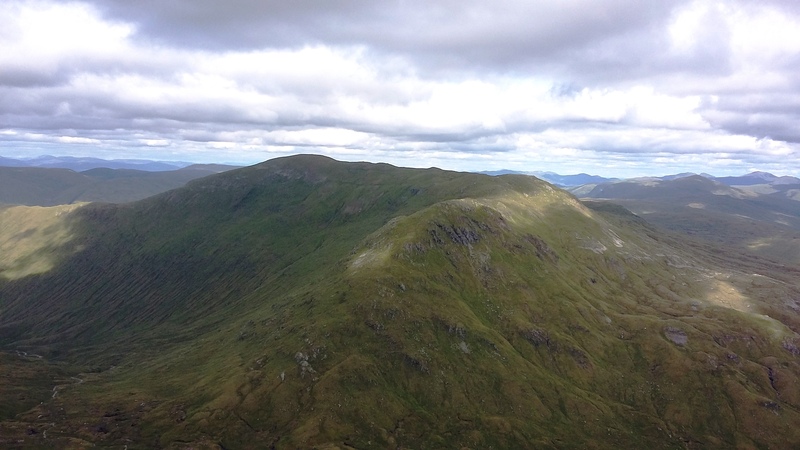 Looking across towards Beinn Sheasgarnaich (RHS) and Creag Mhor from the summit of Meall Glas. Interestingly, the grass looks surprisingly good for this altitude, and the sheep also seem to think so too. 20160714_081718. 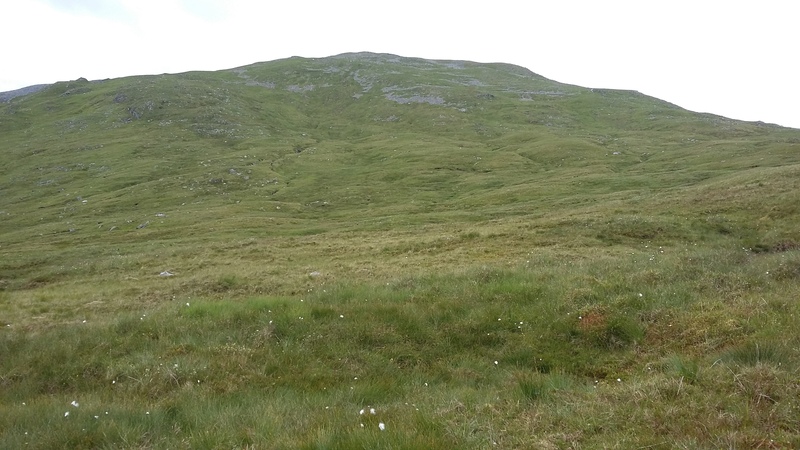 Starting the short descent to the bealach between Meall Glass and Beinn Cheathaich. 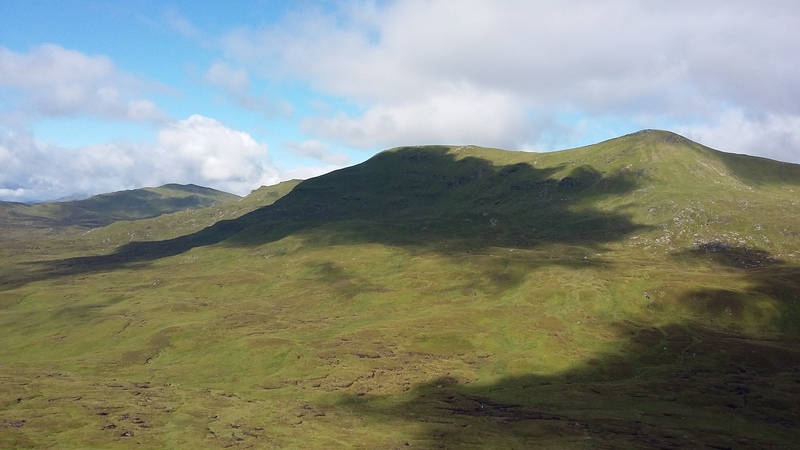 In the background to the right is the Meall a' Churain - Sgiath Chuill ridge, the last hills before the drop into Glen Lochay. 20160714_082831. 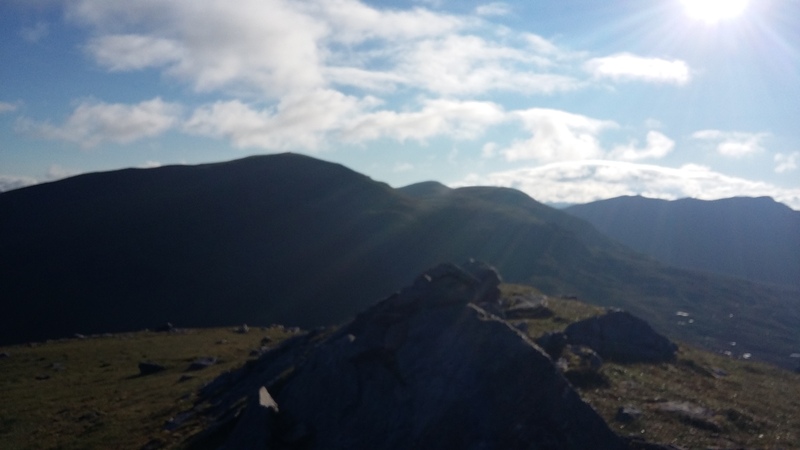 Looking towards Beinn Cheathaich. Some vestigial tracks in this area. Again, note the grass and sheep! 20160714_082824. And looking back from the same point towards Meall Glas. 20160714_083552. 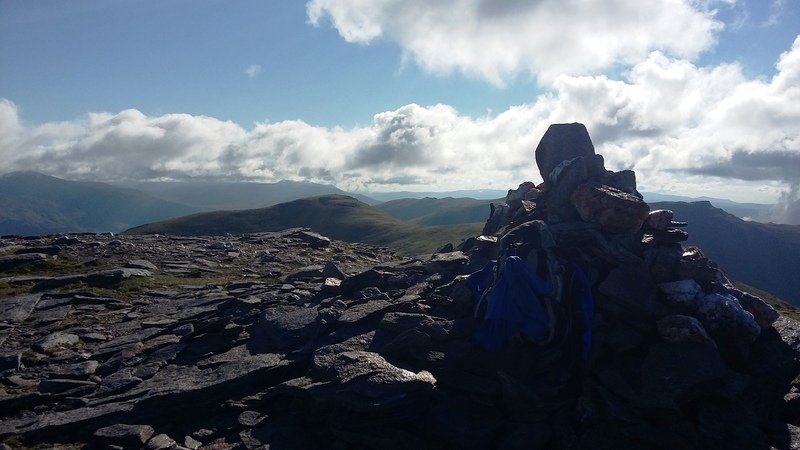 Beinn Cheathaich summit, plus portrait of trusty sac (take 2), looking back West towards Meall Glas. 20160714_085153. 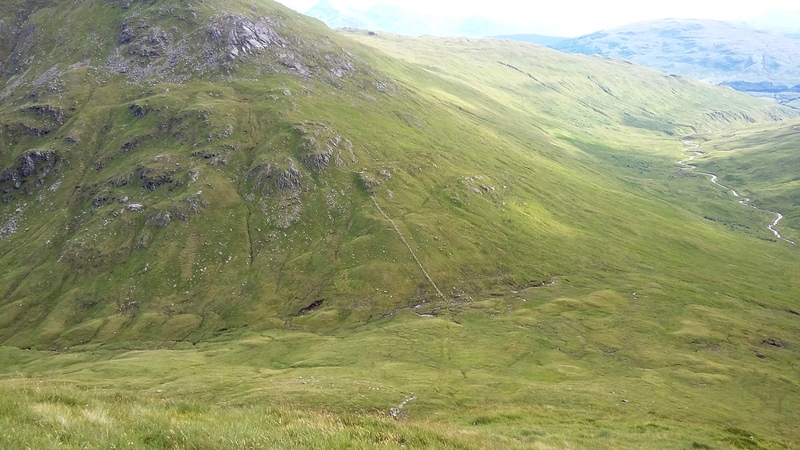 The 300+m descent to the bealach between Beinn Cheathaich and Sgiath Chuil is again pretty straightforward. 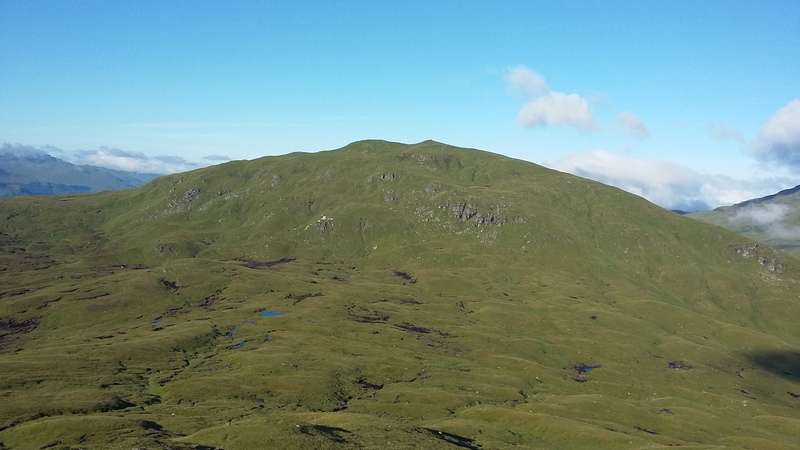 On the RHS of the ridge is Sgiath Chuil and on the LHS is Meall a' Churain. 20160714_091902. 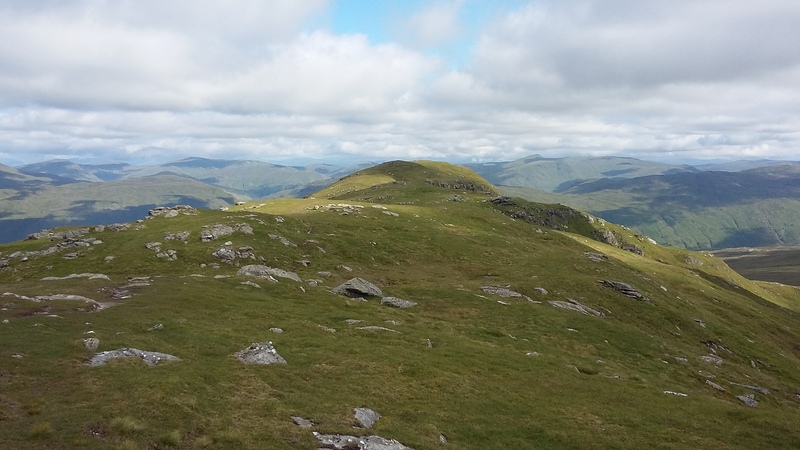 Looking back towards Beinn Chiathaich from the slopes of Sgiath Chuil. 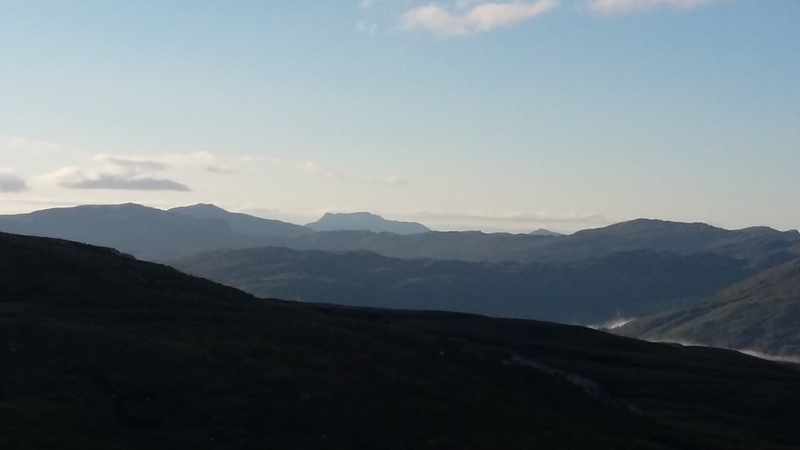 In the far distance is the first peak of the day, Beinn nan Imirean. 20160714_094310. 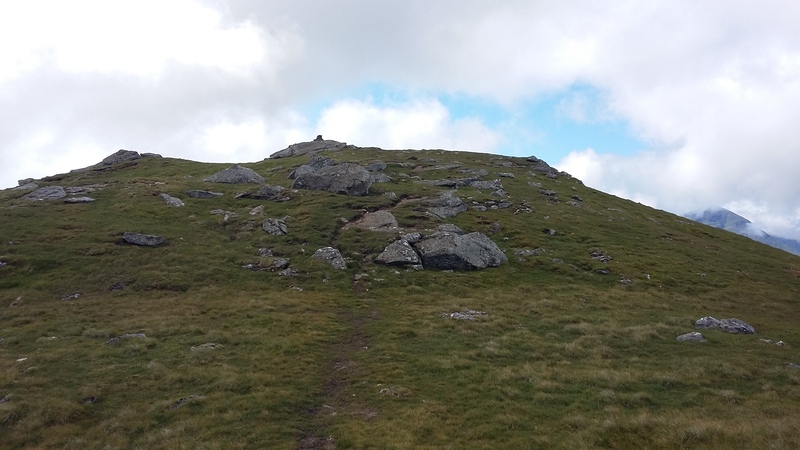 Approaching the summit of Sgiath Chuil. Still very easy going, with a clear if small track to help in poor visibility. 20160714_094616. Panorama looking South from the summit of Sgiath Chuil. Pretty damned fine, I'd say! 20160714_094638. 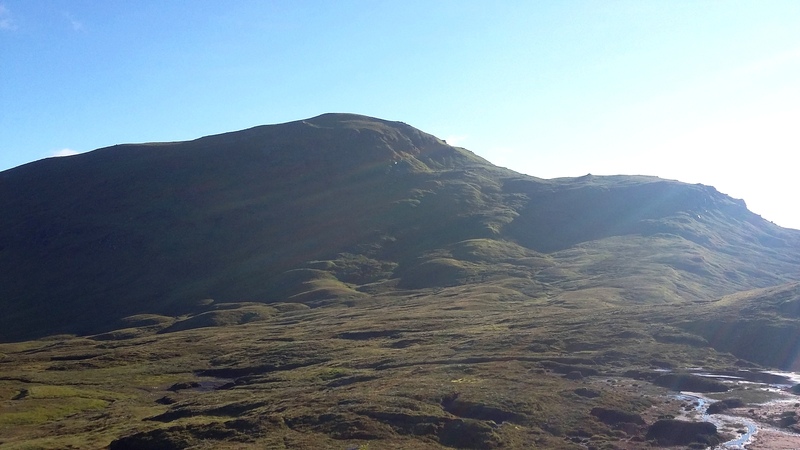 Meall a' Churain viewed from Sgiath Chuil. 20160714_094702. 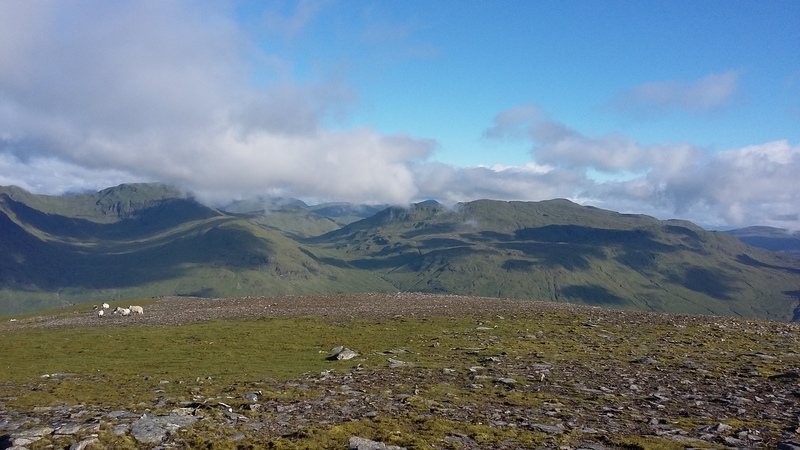 Looking back from Meall a' Churain towards Beinn Chiathaich and the ridge route I've traversed so far. 20160714_100550. The descent to Glen Lochay more or less following the burn is easy enough. 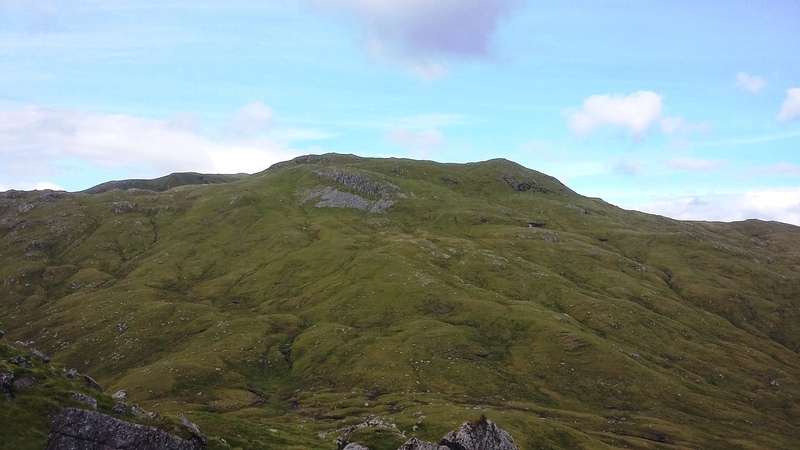 But it's not the descent that is daunting: it's the 850m climb to Beinn Sheasgarnaich (centre pic), which also looks a long way off! 20160714_104415. 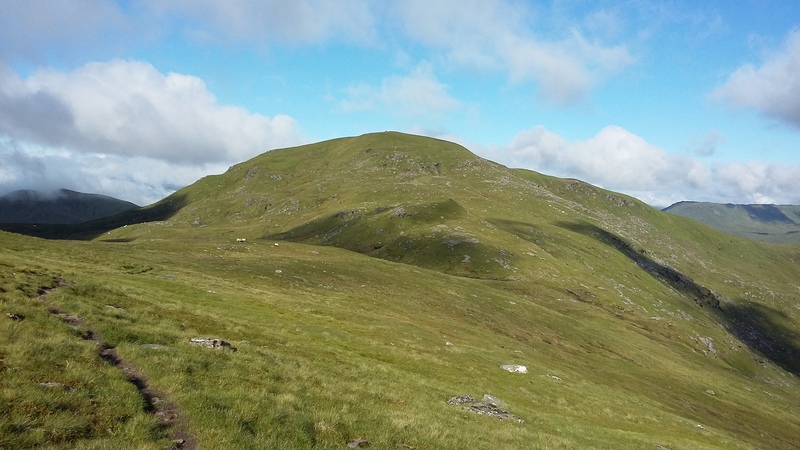 Looking back up at Beinn a' Churain, more or less along the line of my descent. 20160714_105156. Close to the glen bottom, turn left, and a gentle walk West for a couple of km before heading up towards Sheasgarnaich. Interesting to see quite a few areas cordoned off with deer fencing, behind which there has been mixed tree planting. Very encouraging, I must say. It's clear from the stumps evidence that this area was once wooded, but the 20th century planting of monoculture coniferous forests does not make for a very attractive landscape, and it's good to see the powers that be going for something a bit more varied. 20160714_111819. 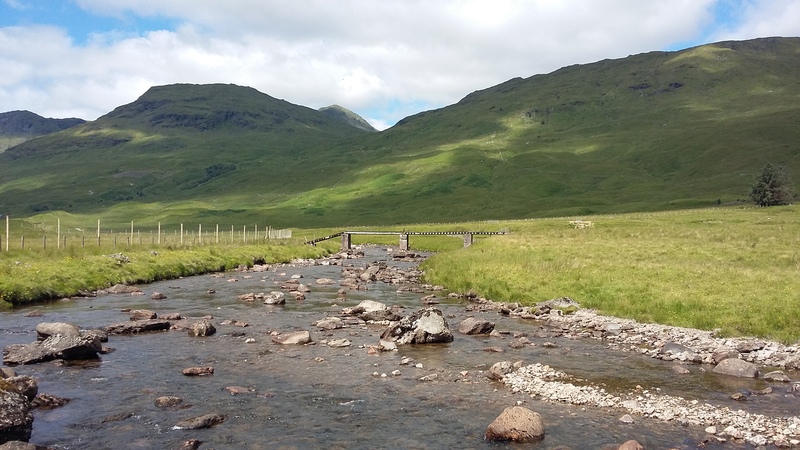 I follow the burn to the footbridge, where, after refuelling with a cheeze, salami and Branston Pickle sandwich, I take a bearing (the ridge hides the summit at this point) and head towards Beinn Sheasgarnaich (850m climb ). It is still very hot, and I've a feeling that flogging up the hill is going to be really quite energy-sapping. 20160714_113503. Evidence of tree cover in the past (just above Badour). 20160714_112727. 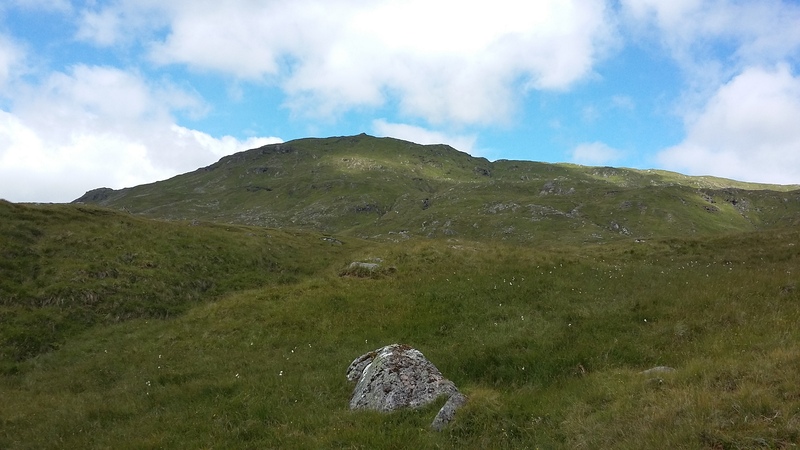 Looking up in the direction of the ascent to Beinn Sheasgarnaich (not visible because of the ridge in the foreground). Looks near, and quite mild, huh? 20160714_124925. In fact it takes me 80 minutes just to get the 2km and 550m ascent up to the ridge, and I'm feeling quite tired and sweaty when I get there! 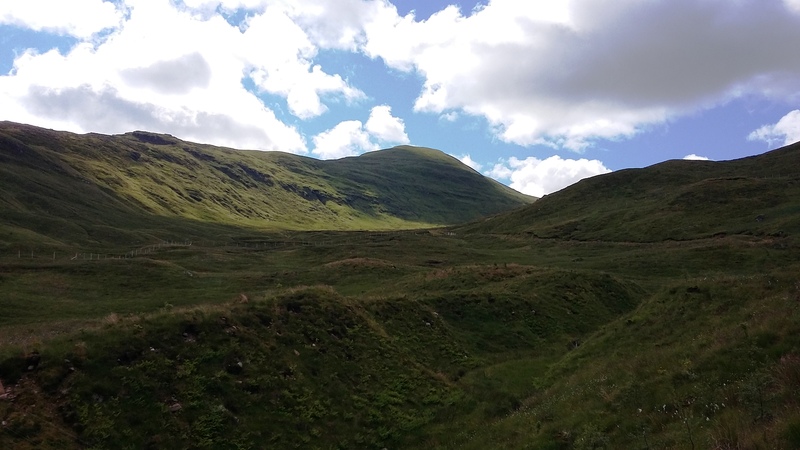 This is looking back across Glen Lochay towards Meall a' Churain and Sgiath Chuil. 20160714_124916. And this looking ahead to Sron Tairbh. 20160714_133517. 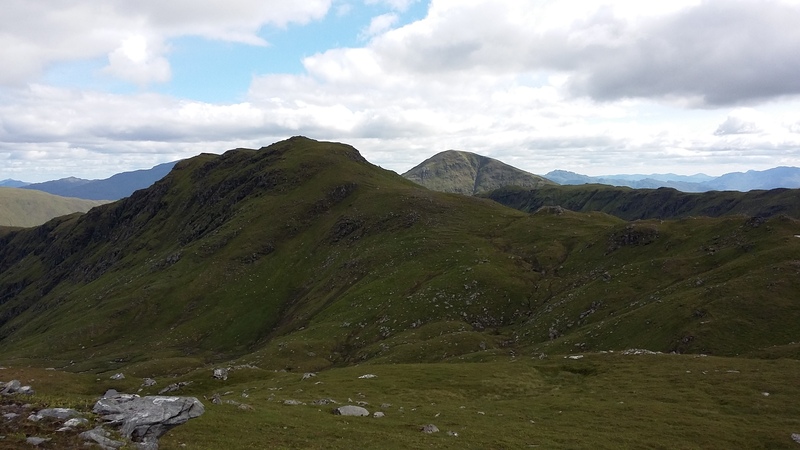 Once arrived at Sron Tairbh, I ditch my sac and hurry across the undulating ridge to Beinn Sheasgarnaich. 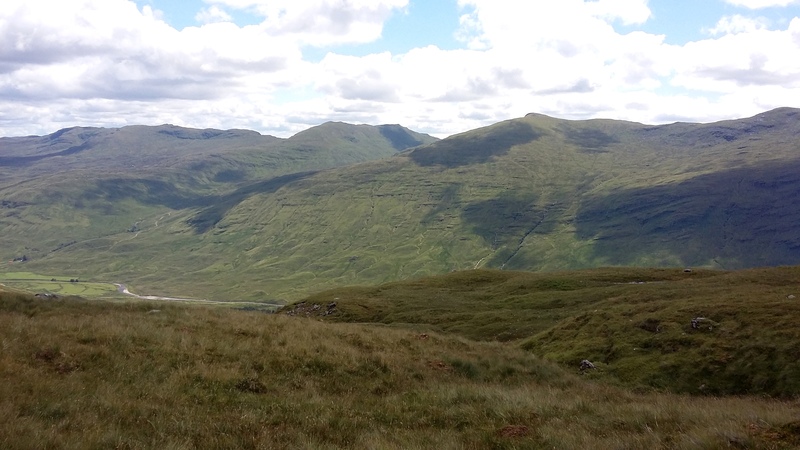 This is the view from Sron Tairbh towards Beinn Sheasgarnaich, with Stob an Fhir-Bhogha on the extreme right. 20160714_135255. 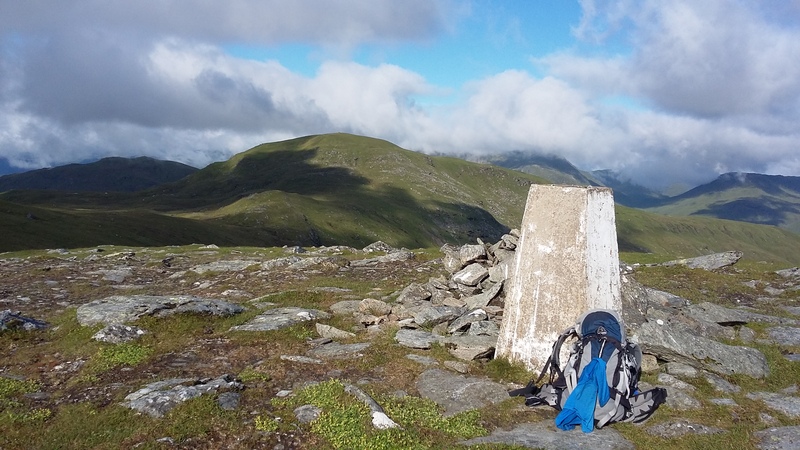 At last: on Beinn Sheasgarnaich! Feels like I'm at least half way there! 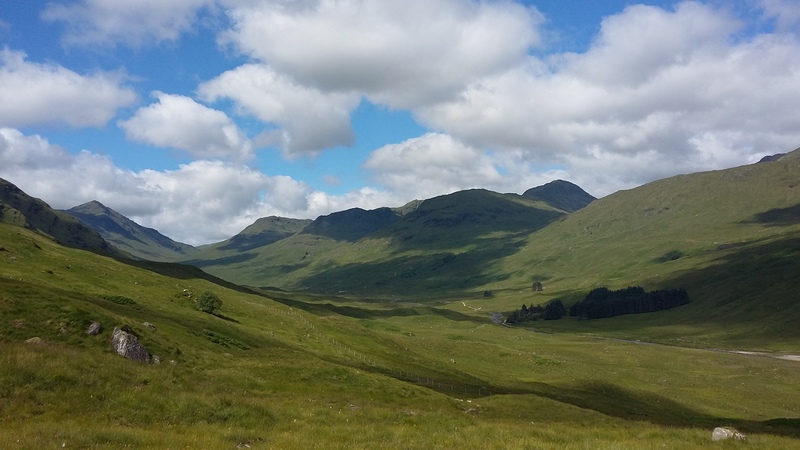 This view is looking more or less South back the way I have just come, towards Stob an Fhir-Bhogha and Sron Tairbh. On the way back to Sron Tairbh I meet the first walker of the day. And am accompanied by the magical sound of a piping Golden Plover that seems to be moving parallel to me. 20160714_142451. ....but quite a drop and subsequent ascent! 400m to be precise. I find the ascent pretty tiring, so I'm abominably slow. 20160714_154502. 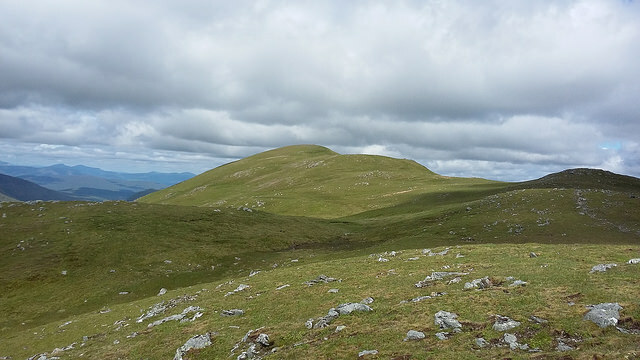 Looking North East back from the summit towards the Sron Tairbh - Beinn Sheasgarnaich ridge. 20160714_160127. And now on to Stob nan Clach, the gently undulating ground being quite a relief after the climb to Creag Mhor. 20160714_161827. 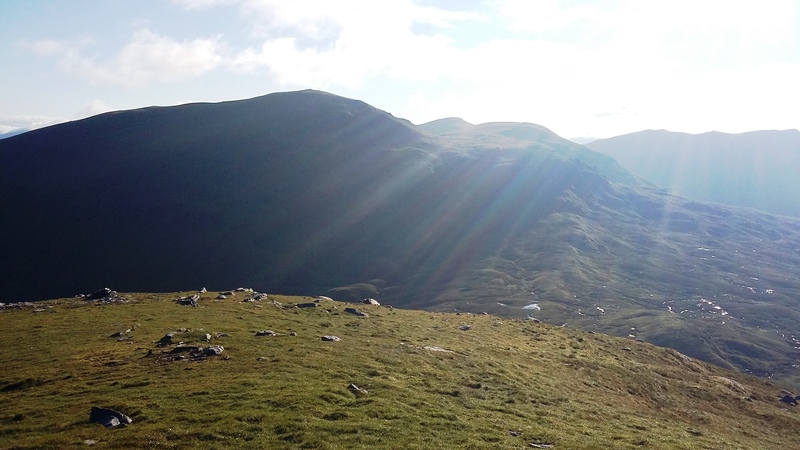 Looking back towards Creag Mhor on the way to Stob nan Clach, showing why route finding would be important in clag! 20160714_162812. 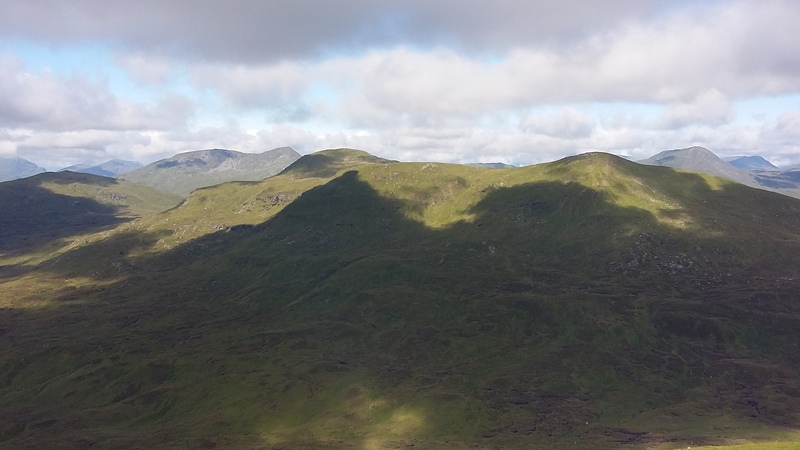 Sadly and annoyingly, there is a ANOTHER ridge separating the Creag Mhor - Stob nan Clach ridge from Ben Challum. And I can't see any way around it; so yet another descent and ascent, albeit the ascent is only about 125m this time. But it's still pretty hot, and at this time of the round it's really hard work. Lack of hill fitness is really beginning to tell. 20160714_170732. Looking down I see the descent to the bealach before the ascent to Ben Challum. And this is where I realise what a real isolated LUMP this mountain is - I can't even capture a view of the entire ascent on my camera! There's just no way of approaching it without a big climb. This is the approach with the shortest climb, but it's still all of 500m, which prospect is less than entirely welcome at this point in the day! Yep, Ben Chal Lump! 20160714_183646. So, gritting my teeth, I put my head down and, horribly slowly, crawl up the mountain, taking fully an hour to get to the summit. Where I stop for some sustenance, liquid and pics. Excellent views all around. 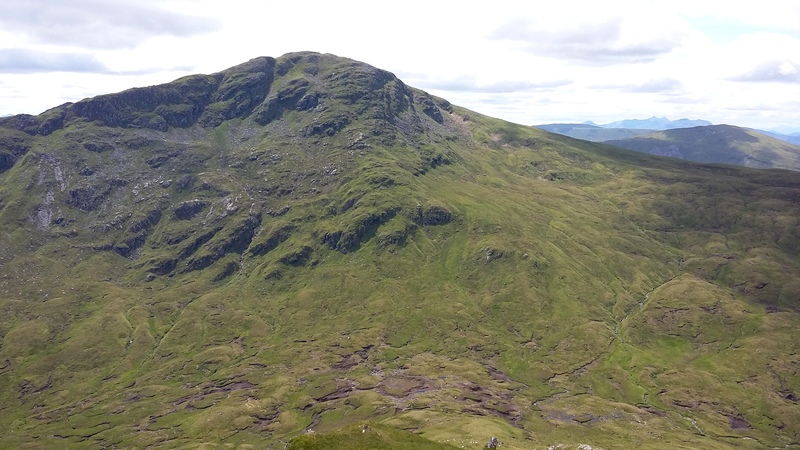 This one looking South, with the Ben Challump South Top in the foreground, and the Ben More - Cruach Ardrain group in the background. 20160714_183140 ...looking back the way I've come, with Sheasgarnaich in the background on the right. After what feels like a very long breather, I set off on the last leg, to the South Top, and then back down to Auchtertyre. 20160714_192220. I don't see any track down, so I just take a sighting on the railway cutting at Auchtertyre and head off in that direction. It's rough, but not particularly challenging ground. This is the view looking back up at Challum at the point where the slope flattens out, and I can jog a bit. 20160714_194456. And this is looking towards the Auchtertyre railway cutting. Nearly there now! Shortly after this I meet up with a quad bike trail and I continue jogging along it. With predictable results, given the slimy wet patches at every low point! I've gone flat on my bum several times on the round during descents, but the muddy wet patches dried out pretty quickly in the warmth. But now I have a huge sopping wet black-muddy patch that will never dry out in the 15 minutes before I get back. Serves me right! I get back to the car just after 8.00pm, and quickly change and set off on the 6.5 hour journey home, stopping only to cook and eat some pasta in one of the Loch Lomond laybys , eventually pulling into my driveway at 3.00am. 5 + 1 + 3??? 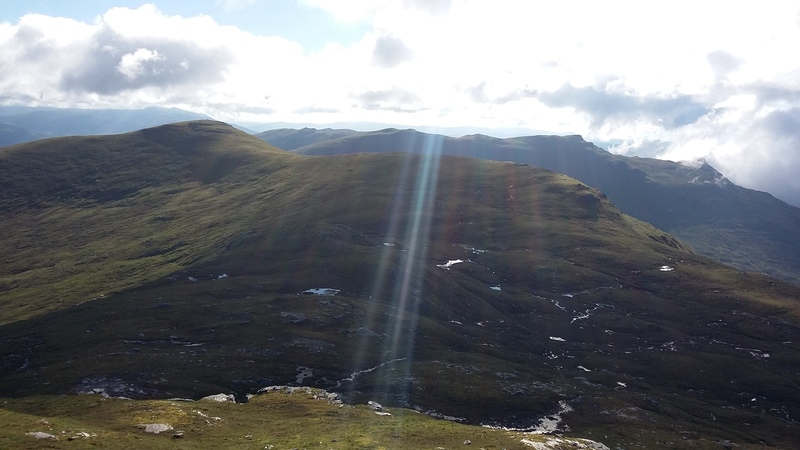 5 munros, 1 Corbett, and 3 tops. Last edited by Alteknacker on Tue Jan 29, 2019 1:19 pm, edited 6 times in total. Big route, big day - especially with c. 300 miles each way to get there/back - well done ! "Ben Chal Lump.... "
Good effort Alteknacker. That looks a big day! I have only seen these 'lumps' in the depths of winter thankfully in great weather. Good to see them in green! Entertaining report of what looks like an epic day, If I attempted that i'd still probably be there now. As your your blury pic it would have been the bright sunlight throwing the auto focus off, happens sometimes. rockhopper wrote: Big route, big day - especially with c. 300 miles each way to get there/back - well done ! "Ben Chal Lump.... "
Thanks RH. 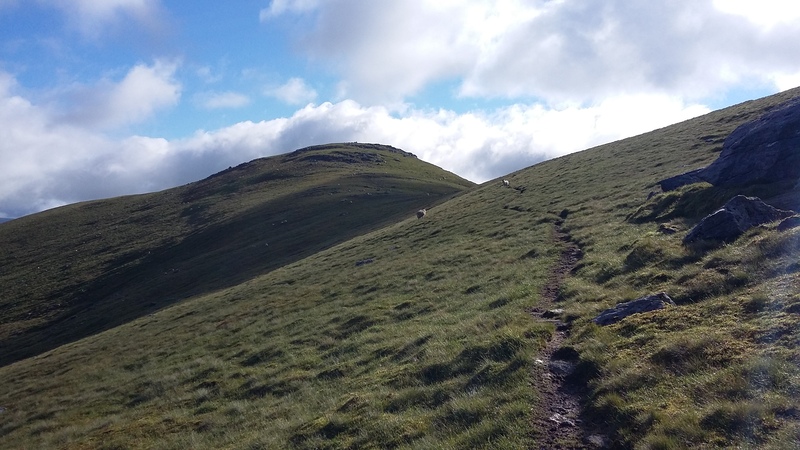 Yes, I can really recommend the route for fantastic views, notwithstanding the multiple ascents and descents. 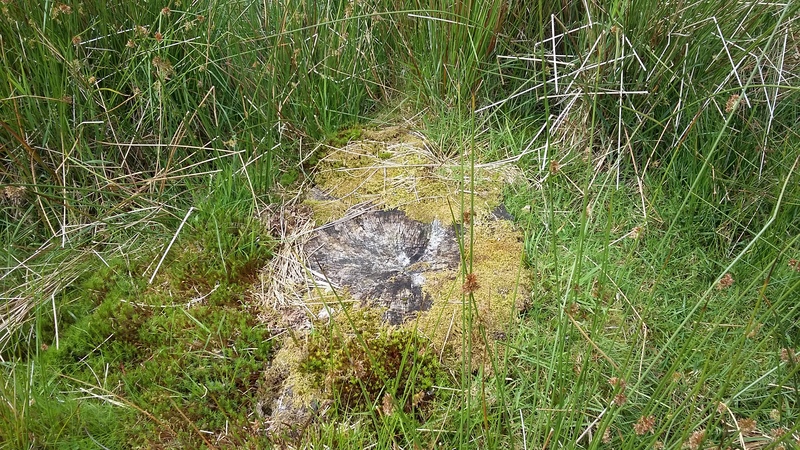 ...I have only seen these 'lumps' in the depths of winter thankfully in great weather. Good to see them in green! I imagine they would be even better in white. Did my first serious winter stuff this year, and I'm completely sold on it!! johnkaysleftleg wrote: Entertaining report of what looks like an epic day, If I attempted that i'd still probably be there now. Thanks for the tip on the pic focus problem. It definitely could have been this, because I noticed it several times when pointing in the general direction of the sun. 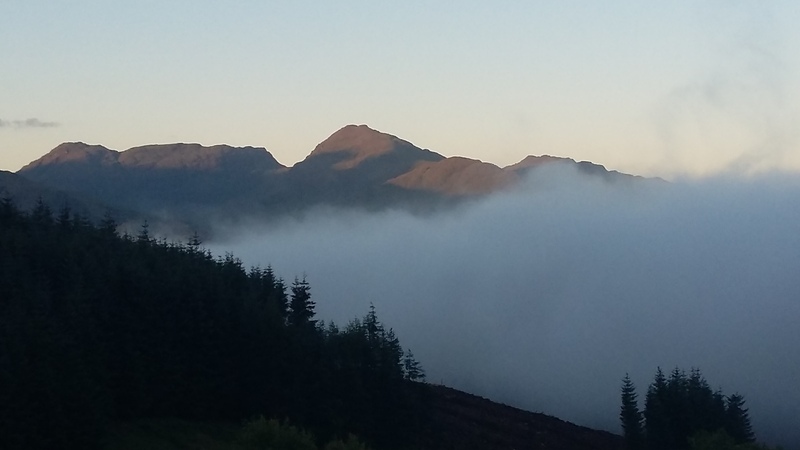 On the other hand, I tried to take multiple pics of Ben Lui in the morning (ie the sun was behind me) and the autofocus just didn't want to know. Why can't I just point and press a button...??? If you cover the sun if a finger in the shot, semi depress the shutter till if focuses, and then take your finger away you can get around the problem. Looked a good day with decent views. That's one way to bag the Munros from England, Alteknacker. A great effort. You've said before you prefer to get as many hills in as you can at once, seeing as your time in Scotland is limited. I guess this is the way to do it if you're going there for a day at a time. My own strategy was to go for a week or two, so things had to be paced and I could not have managed an epic every day, even if I were capable of one like yours anyway. I also appreciate that living outside Scotland means having to maintain this level of fitness when you're away from the Highlands, and you've had plenty of English/Welsh big days between your trips to the Munros. Thanks Petr. PS have you considered the Welsh 3000ers yet...?? ?